In Canada in the 1900s, Eaton's was a famous and fabulous store. They were really on the cutting edge regarding nutrition and day care for the patrons. A catalog was started in the late 19th century as founder Timothy Eaton recognized a market for the people who lived on farms and further afield from the large Canadian cities. In those days, Eaton's store offered more than just "goods" for sale. They offered superb service, comfortable surroundings, and fine dining. Branches of the store shot up all over the country and so did the restaurants, like the Georgian Room (Toronto 1924), the Green Room (in 1927), Le 9e (the ninth floor in Montreal in 1931), the Marine Room (Vancouver in 1949), and more. One Flora McCrae married John Craig Eaton (Timothy's son) and went on to become a national figure for almost seven decades and with an abundance of fortitude, took the Eaton family, through her philanthropic efforts, on to become "Canadian Royalty", or as close to royalty in Canada as they could become. Those were the days when one went out to tea (served in a china cup and saucer no less) and wore hats and gloves. 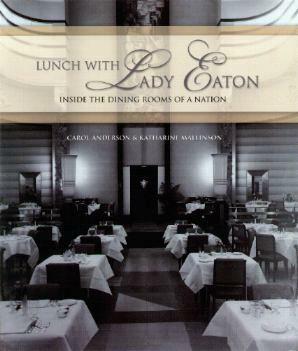 This was an era of elegance and sophistication and Lady Eaton's taste was reflected in all of the restaurants. Dining at the prestigious lunchrooms (some 5,000 people a day) was really the "in" thing and the places to be seen in. The book is wonderfully complimented with old black and white photographs of the stores, the clientele, and the staff. Finally, there are some recipes to try out - modified of course, for today's ingredients. Conclusion - A nostalgic look at an empire of yesteryear, full of class.